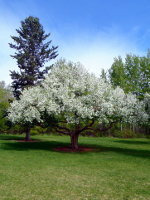 Siberian Crab Apple is a beautiful, cold hardy, ornamental tree. Its stunning white blossoms burst in the spring to produce deep red fruit. 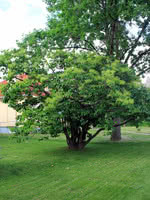 If you are looking for a great landscape or shade tree, Siberian Crab Apple is a beautiful addition to any yard. As a rootstock, it is one of the hardiest available. Just be aware that Siberian Crab Apple may be incompatible with varieties that don't have crab apple parentage.